But Still Good News Consumer warning: some of this news is old, but some of it is also no longer true (i.e. Bill's mailing address, John's old email address, etc.) We just archive it here as it becomes old news and/or obsolete, so please contact a member of the mailing list for updates if you need any specific information, and don't rely on it per se. 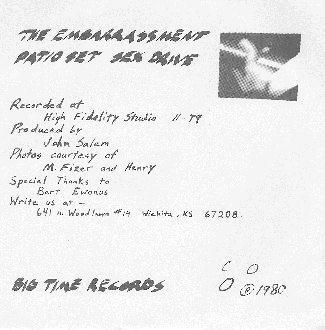 Thanks to Jim Rosencutter (and a belated thanks to Stephen Buonopane, who sent photocopies of the covers several years ago), the celebrated cover art for the Embarrassment EP is now in the gallery. Snappy Side: small, medium-sized, or practically life-sized. Happy Side: small, medium-sized, or practically life-sized. Don't Choose the Wrong Size! In addition to the amazing Lawrence scene site maintained by Mike Blur, with its own Embarrassment page, Jim Rosencutter, the "Fifth Embo", has a nice little supplemental web site that features some way-cool scans -- click on over to find out why the Embarrassment were The Band that didn't Stop Making Sense, among other treats. We recently heard from the bands VTOL and Snuff the Ficus, who cover several Embarrassment songs. There's even a song sample for "Man with the Extra Special Eyes" on the VTOL site. Check out these bands who've displayed their good taste already, or see the whole list of bands who like us like the Embarrassment and thus we like. The Embarrassment's two albums in print, God Help Us and Heyday: 1979-1983 (both available from Bar/None records) are available in RealAudio format in their entirety from Interjuke (and for purchase from CDNow) Click here for details. and their first CD is being released nationally on 1/20. The official link for the band is at: Eastern Front. At long last, courtesy of fan Dwight Douglas, a Big Dipper page is on the web! Click here to see it. Somewhat experimentally, I've set up an Embarrassment mailing list to allow the more dedicated among the fanbase to have an ongoing exchange of news, links, and messages. with the word subscribe in the body of the message. Instructions about using the list will be sent back via a return message. Scott Born of Lawrence (and the band Killcreek) reports that Freedy's laid down a few tracks, and records some Embos tunes on the road, but has no specific release plans. He's tracking down further details. 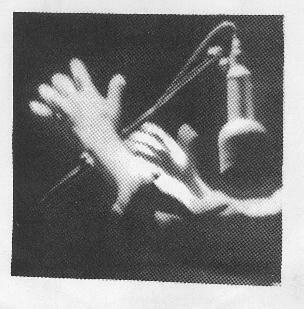 Perfect Sound Forever, a web-based music zine, recently ran an article on The Embarrassment. In keeping with the trend of net-cruising Embo alumni, we were happy to hear from John Nichols and his wife Julia recently. John's agreed to have his email address jayhawksfans@msn.com listed here. John's not up to anything in particular musically these days, but has "lots of good ideas". He wasn't sure about any particular recent bands he liked, but gave us a list of the most recent CDs he bought: The Stooges - Funhouse, The Beatles Anthology II, The Cure Remix. The last show he saw was in Florida last summer - The Cure. "Everything is fine here. We love living in Florida. Lots to do here and the weather is great, of course." Bassplayer, Bill Goffrier, Watercolor, 1995. From the collection of the Webmaster. We've reserved the domain www.embarrassment.org for future use as the home of these pages, when a reliable web server comes free I can ethically and legally use. We hope to have the pages on a separate server later in 1997. If you'd like to help contribute toward the cost of maintaining the domain (50 samoleans a year to the Internic), please contact me (wall@cmu.edu). 10/29/96 Embos Tribute Album? Sources tell The Embarrassment Home Page that various artist(s) have been recording Embos covers for Bar/None for an as-yet-unannounced project. We've been able to confirm at least one artist. Is an Embos tribute LP in the works?!? Write to Bar/None if you're interested! (see address below.) Way cool! 9/23/96 Pass on by...Wellsville... from Embo fan Lin Wilson, this nice retouch of an interstate exit near Wichita. 6/7/96 EMBOS TRIBUTE CONCERT NYC 6/25/96! The Don Juans played a tribute concert as a fundraiser in New York City on June 25. I hope to get further details posted at some point. Click here for a semi-random list of Embos-related links, provided mostly by you, the diehard Embos fans of the world..
Bill encourages anyone to "write or inquire about rare merchandise or even original Embo art." Additional news courtesy of Bill: there is am upcoming art exhibit in Wichita of Bill's original paintings "that is supposed to include a lot of Embo art." Wow! (No dates at this writing.) Bill and his wife Joanne are also expecting a baby this summer. Jon Nichols is living in Orlando and is a manager for America West Airlines. Ron Klaus is living in Phoenix. This page is new and vastly improved! Thanks to many contributions from many people (hopefully many acknowledged below), this page has been expanded from a simple discography to more kind of a fan-oriented page. In order not to spam your web browsers with many graphics, it's been broken up into separate sections. While many new things (pictures, etc.) have been added, there are a few things that will still be under construction for a while. Please hang in there, and make a contribution (see below) if you can! Thanks to Bill Goffrier, I've been able to finally clear up which Big Dipper songs started out as Embos songs. Check out the last section of the discography for a discussion of these songs. WANTED: Information about web sites for Big Dipper and the Del Fuegos to link here. Please mail to me at the address below if you know of any! 10/95 Heyday! released by Bar-None! Possibly the most exciting thing that could have happened for Embos fans since the Reunion tour or maybe the Retrospective cassette, Bar/None's long-promised double CD of virtually every Embos tune previously available not on God Help Us and many that are flat-out never-before available is out! Check out the track listing and comments.